Cosmo Doyle: Miniature schnauzer, family protector and living a la mode enthusiast. I was asked by someone recently, “why do you feature Sadie on the blog? What does she have to do with living a la mode?” The answer is simple, she is the being who caused me to slow down and evaluate what was important to me. The caninification of living a la mode if you will. I did not know how truly wonderful it would be to welcome a dog into my life until I adopted Sadie. She elevates everything, even the most basic experiences – walking, napping, watching TV – to extraordinary moments of serenity. How could I not feature her? If it was not for Sadie, I don’t think I would have arrived at my living a la mode mindset, let alone start a blog. 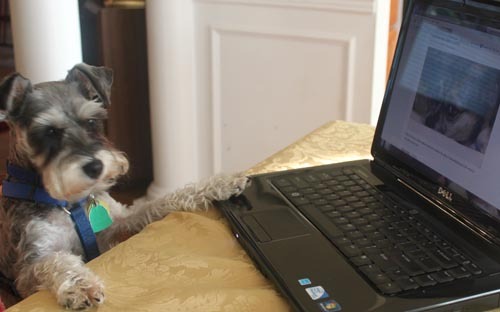 Oh and Schnauzers, particularly the miniature ones, love a good lifestyle blog. And Sadie posts are popular with this breed in particular. And I’m no fool. I am not going to alienate anyone or any living thing that can give me a page view. Wow! That is the cutest dog I’ve ever seen! Cosmo is adorable.